Alongside a new version of Sling TV for the Apple TV, Sling adds a dozen new channels from Viacom and three from Fox. Most are available on both the single and multi-stream service. Sling expanded its channel lineup by 15 channels on Monday, coinciding with the release of its new Apple TV app and a redesigned user interface. With the addition of Viacom and new Fox-owned content, Sling TV now has more than 365 channels with approximately 50,000 hours of on-demand and replay content. 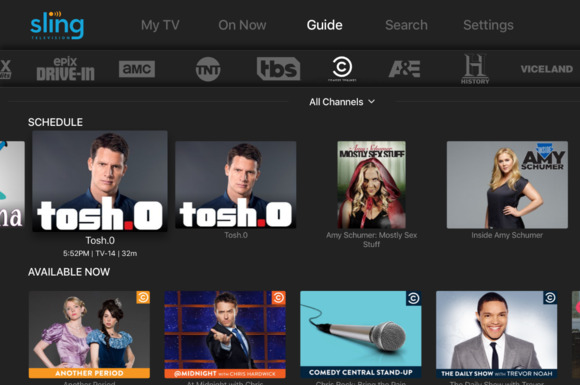 Comedy Central is now part of Sling’s $20 per month “Best of Live TV” streaming offering, with the other 11 channels added to Sling’s various “extra” channel packages, available for an additional $5 per month. Nick Jr., NickToons, TeenNick, Disney Jr., Disney XD, Boomerang, Baby TV and Duck TV have been added to the Kids Extra package, while a new Comedy Plus Extra option includes MTV, Spike, MTV2, Logo, CMT, TV Land and truTV. The Lifestyle Extra package is now Lifestyle Plus extra and adds H1, BET, Cooking Channel, DIY, FYI, WE TV, and Lifetime Movie Network. If you’re subscribed to the beta multi-stream service, the “Best of Live TV” option will now include Nick Jr and BET as well as Comedy Central. The rest of Viacom’s new Sling live TV channels will be available through similar extra packages as the single-stream service. Multi-stream customers also gain three new live channels to the basic package from Fox owned networks FXX, Nat Geo Wild, and FS2. That brings the total channels on the beta multi-stream service to 36 (27 on the single-stream option). The bad news? Sling still hasn’t addressed some of the channel discrepancies that we pointed out at the launch of the multi-stream option back in April. You still can’t get channels including ESPN, ESPN2, Disney Channel, and Freeform. The same is generally applicable for the Extra packages, which are still also missing some content for multi-stream subscribers. Why this matters: While we’re glad Viacom is making its content available across both of Sling TV’s service options, we’d still like to see the company work to streamline content options and simplify their product offering. We think in the end having two service options is a bit confusing.